Do you have a question for the CVSE? Contact them directly here. The Commercial Vehicle Safety Enforcement Branch (CVSE) makes sure commercial carriers comply with the regulations surrounding moving goods across the province. It is a vital component of the work we do here in the BC Ministry of Transportation and Infrastructure. Steve Bauer, Supervisor of the Nordel Weigh Scale in the Lower Mainland, took time to answer some questions about his position and the role of the CVSE in keeping commercial transportation moving safely across the province. Q: What does a day in the life of a CVSE officer look like? A: Actually, no two days here are ever really alike. The station is a constantly changing environment with new faces and new scenarios on a daily basis. Did you know that the Nordel Weigh Scale sees approximately 350 trucks per hour? That adds up to an incredible amount of volume in a single day. Traffic volumes like that require a tight knit team and I can honestly say that we have a real camaraderie here at the station. I am currently supported by seven (soon to be nine) full time staff. Our Commercial Transport Inspector, whose position resides solely at the scale, will be joined by two more full time Inspectors at the end of March. There also are four Commercial Transport Enforcement Officers (CTEOs) at the station. They have a unique hybrid role which allows them to be both mobile and stationary at the scale when required. In addition to those officers, we recently welcomed two new staff members to our team who are in the training process to become CTEOs. Commercial Transport Enforcement Officers spend the majority of their day on the road seeking out evasive offenders who do not check into the weigh scales. Their patrol is focussed on, but not limited to: Delta, Richmond, New Westminster and Burnaby. Q: Which leads to our next question; could you explain why the CVSE is so invaluable to the safety of the travelling public? A: CVSE officers are, quite literally, experts in the field of commercial vehicle transportation safety and regulation. The decisions they make regarding compliance and enforcement, keep the province’s highways safer for the motoring public. It doesn’t get much bigger than that. Q: What sort of questions do you hear most often about Commercial Vehicle Safety Enforcement? A: Actually, I hear a lot of questions and sometimes people think their question is kind of silly, so, would like to stress that there are no silly questions. It is important for everyone to know that CVSE officers are here to answer any questions they might have and to use us as much as possible. We are trained in a variety of Provincial Acts and Regulation, Policies and Procedures which allows us to help educate drivers and would rather answer a hundred silly questions, than have to enforce compliance because no one asked. Steve has been working with the CVSE for 13 years, and before joining the team, he worked in the trucking industry, driving North/South between Oregon, Washington and BC. His experience in the commercial trucking industry gives him the ability to understand life behind the wheel as well as life behind the scale. Thanks for sharing Steve! Hi, if the scales are full and I would have to stop on the “highway” to wait to get in can I bypass? It would be extremely unsafe to stop on a highway with traffic doing highway speeds. Staff at scales are instructed to close operations before traffic backs up on the highway. It’s an offence to bypass a scale, but our staff are also instructed to use discretion — we don’t want to see anyone in a dangerous situation. I was wondering if a maintainence issue is mentioned on the vehicle pretrip and I get pulled in, is that ticket on me or the company? Is it up to me to get maintenence done or the company? Good morning Brent – great question. All weights referred or displayed are in kilograms at our scales, as is all GVW licencing information on the ICBC documents as well as the data plate information on the vehicle itself, (usually on the doorpost) as well as the ratings displayed on the tires. I will be hauling a 28 ft closed in trailer with my 1 ton truck to move my sister from Vancouver to alberta. Do I need to pull into the scales or can I just bypass them ? Also have the same question about my 37 ft fifth wheel holiday trailer. In BC, all vehicles licensed over 5,500 kg must report to weigh scales, unless they have a “Way To Go” transponder and get a green light on it to bypass. You are more than welcome to report to check weights once loaded or if you have general questions. Hope that this helps! I am hauling a trailer with a GVWR of 12000lbs (5400kgs). I don’t carry that much weight in the trailer. Do I require anything more than a Class 5 licence to haul? Just so long as it hasn’t been loaded to it’s max. with my own yard waste and prunings. Do I still need to obtain an NSC number? I wonder if I will be considered a Carrier if I am only hauling my own stuff? I have a cube van with GVWR 5580 , I want to reduce it, because I do not need this GVWR and I pay more when I am taking the ferry to Victoria, Can I lower the GVWR, I never go more than 3700KG. Please let me know how can I do it? years so it does not have a current inspection certificate. We asked the CVSE your question and they let us know that Commercial Vehicles with a licenced gross vehicle weight of 8,201kg or more require a mandatory mechanical safety inspection annually. Even though you have indicated that you plan on using the vehicle for personal use, that doesn’t preclude you from the requirement of inspection. The inspection requirement is based on the type of vehicle and the weight it is licenced at. Hope this information is helpful. We have sent your question forward to the good folks at the CVSE for an answer. Stay tuned. For safety reasons, I wish to weigh my camper trailer to get the tow vehicle GVW, trailer axle weight, individual wheel weight and tongue weight and would like to go to the weigh scales at Yahk BC after hours so as not to impede traffic. Are the scales open/closed on a fixed schedule – how would I obtain this schedule? Hi Stephen. Some inspection stations have set hours, other stations (including Yahk) have random hours. I suggest giving the station a call to discuss your needs: 250-424-5459. I’m not from BC and have a weight question. I’m researching some information: What is the overall truck and trailer weight allowed when running within the province of BC. Also, what is the allowable axle weights for tandem truck with tridem 53″ van and alternately tridem reefer van. Hi Anne and thanks for your questions. These sound like questions best sent directly to the good folks at the CVSE. Here is their email address: CVSEgeneralinquiry@gov.bc.ca That way you can chat back and forth for clarification. I am looking at buying a truck to clear snow and other uses on my property in the Okanagan – its GVW is 7500 kg. It will only be used for ‘personal’ uses – I will not be using for any commercial activities. Do I need to take it through a scale? Are there any other things I need to be aware of with a vehicle of this size that would not be obvious to ‘Joe average driver who has never owned a large vehicle before’? I was reading through regulations and noticed that a trailer can be no wider than 2.6 meters, but there is an exemption for “loose” hay or straw to be up too 3.1 meters in width. Does this mean I could have 3 small rectangular bales of hay across the deck of my trailer as long as they are 3.1 meters or less in total width? I’m not sure what “loose” hay means, as if the hay was actually loose it would be flying all over the road, or if it means loose in the sense that it could be sticking over the edges of the trailer a little bit while being tied in a bale. This would actually be a question for ICBC or your insurance company when you are registering your vehicle and whether they determine it to be tare or net weight. Hi I have a 5 th wheel and truck and would like to find out the total weight CVWR .is there any where in the lower mainland i can do this .I live in Delta. 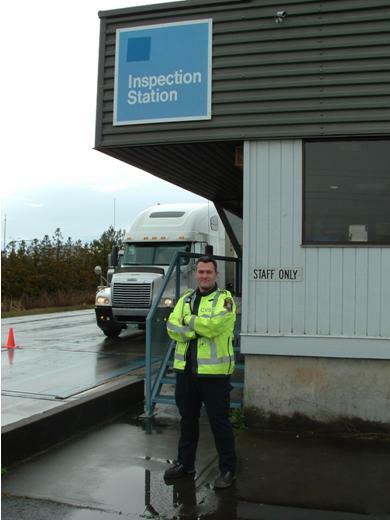 Here is a link to a list of inspection stations across the province. You should be able to take your rig in and have it weighed. http://www.th.gov.bc.ca/cvse/inspection_stations.htm Hope that this helps. Hi! I have an ’09 Kenworth T-800 that I’m planning on using to pull my RV. It will be licensed “not for hire,” and in my personal name not a company name so there will be no National Safety Code it will be under. I know a lot of people do it, and they don’t have to run log books or report to scales. It is commercial by design, but not commercially insured. What do I need to have for paperwork in case I get pulled over? A lot of the CVSE officers around here are new & in training so I’m thinking there may be issues. Thanks for your question about operating your Kenworth on a non-commercial basis. I’m checking in with our CVSE folks on this, and will get back to you here with an answer. Here’s the rule for tongue length… You need to measure from the center of the last axle on your power unit, to where the hitch is on the back of the power unit. The tongue length can be twice the amount of that measurement. If you are NOT licenced commercially, and it says that on your insurance papers (ICBC won’t do this, but maybe you’re from outside the province) the rules of Commercial Transport do not apply. The National Safety Code does not require log books in these circumstances, and folks at our inspection stations say they do not stop or pursue vehicles that are recreational. If you have any further questions or need clarification on any of this, please contact CVSE Team Lead Darryl Neville, at Darryl.Neville@gov.bc.ca or 250-953-4011. I have a 1992 F-Superduty with a 16′ aluminum ITB box that I converted into an RV. The GVWR on the registration states 4999KG, but I suspect it might weigh more than that.The max GVWR on the builders plate states 7300 KG. Do I need to have the truck weighed and up the licensed weight if it exceeds 4999 KG? Thanks for your comment. We shared it forward with the good folks at the CVSE and they informed us that you should phone an inspection station and ask to be weighed and have a form CVSE1061 filled out to certify the weight of your vehicle with the addition of the box that is now built. If your weight exceeds your licenced GVW you can increase your licenced weight with ICBC. Hope that this helps! The CVSE replied directly to you but we are sharing the response here just in case anyone else has the same question. Any vehicle licenced over 5,500kg must report to weigh scales. Inspection requirements don’t start until 8,200kg. The licencing of your vehicle must include the net weight plus the weight you want to haul. In order for your deuce to be legal for travel on BC highways, it can’t be any wider than 8’6” wide or 2.6 metres, or higher than 4.15 metres. When importing a vehicle into British Columbia you must have it inspected at an authorized inspection facility. Because it weighs more than 5,500kg and is a commercial vehicle by definition in the CTA “a motor vehicle having permanently attached to it a truck or delivery body” you must report to all open inspection stations (weigh scales). Hope that this helps! What elements does the pre trip inspection for a trailer need to contain? Thanks for connecting with us here. Here are a couple of resources for you regarding your pre-trip inspection. It sounds like you are asking a question which would be best posed to the US Department of Transportation. If you meant to ask after GVW regulations in Canadian provinces, let us know and we will try to help. I will be towing a trailer weighing 21,000 lbs. My hitch is only rated for 15,000. Would this still be legal as long as my hitch weight does not exceed it’s rated capacity? We spoke to the CVSE and they told us that as long as the hitch capacity is not exceeded, you would be good to go. Hope that this helps! Sir I am looking to buy a 5 ton truck and start by becoming a contractor.i have recently got a class 5 license.My question is how to obtain a Nsc certificate given I will be the one operating a truck and what are the exemptions would a 5 ton carrier would get? thanks for the information but its not clear as what all i have to do to get the certificate.Is there any concerned authority to whom i can talk and help me to get started. Please contact NSCAPPS@gov.bc.ca directly for questions regarding National Safety Code applications for the certificate. Can an Oil/Propane fuel truck that delivers fuel to a home to provide heat, hot water or cooking fuel get a special permit or permission to exceed the 50% seasonal road ban weights in an emergency where as the customer will run out of fuel before the seasonal road bans are lifted? As this would be an essential service. A great question Morgan. We have sent it to the good folks at the CVSE for review. Stay tuned. Once you let us know, we will contact the manager to confirm. Thanks! Thanks for the reply Morgan. Unfortunately, we are going to need a bit more info on your location. What is the town nearest to you? Is a commercial vehicle required to stop at every weigh station on its route and what information is recorded and kept when a commercial vehicle stops at the weigh station? Commercial vehicle regulation regarding stops at weigh stations is listed below. Also, there is no record kept at the weight station unless there is a ticket or notice and order given to the driver. Hope that this helps! Hello sir I am truck driver from Surrey BC. My question is can we pick 20 feet loaded cointaner on back of a combo Chasis pls reply thanks. One of our trucks received a TVR for not having a GVW and Tare displayed. The truck was just DOT inspected in June and they did not request it at that time. We drive several trucks that do not have it displayed, and it has never been an issue, and we have a history of compliance. What is the correct ruling, and how do we go about complying if that is required? Thank you for connecting with us. We have sent your question directly to the CVSE. Stay tuned for more information. I believe the CVSE has responded to your question directly but wanted to confirm that having the GVW or tare weight displayed is not a requirement for a commercial vehicle in British Columbia. In response to Glenn on June 12 . Are you sure that a that moving personal goods would exempt log books? Is the CVSE provincial or national? Are there CVSE offices in Ontario that I can contact? I am borrowing my son in laws 1 ton truck and trailer to move some of my parents belongings to alberta This is his company truck will I need a log book and have to stop at the scales? Good question. We sent your question forward to the good folks at the CVSE, stay tuned! The CVSE has just responded to you directly, but we wanted to share that response here for others in case they have the same question. The law reads that any vehicle licenced for over 5,500kg by law must report to all open vehicle inspection stations to be weighed. You can find the licence GVW of the truck on the registration. In regards to log books, if you have a letter signed by the registered owner, that you are moving personal goods, you are exempt from log books. Hope that this helps and thanks for connecting with us here! If a truck (lease Operator) is running under an NSC number for the company it is hauling for and an over-dimensional permit needs to be purchased, does the permit go under the NSC number that the truck is registered too, or can it go under the lease operators own personal number? Thanks for connecting with us here. We have shared your comment forward with the good folks at the CVSE and they will send you an answer directly to your email. I am not sure I understand the question you are trying to ask. Do you mean the Auditor General? Are you looking to confirm if we have a swipe card system to track truckers hauling info? Let us know and we will try to get you an answer. Thanks! I have a 5 ton truck with a tare weight of approx. 8700kgs. Insurance company says i need to multiply that by 1.5 to get my lowest gvw. which is aprox. 13000 kgs. But I am hauling light materials and only need a 11500 kgs gvw. Am I allowed to lower my gvw. if so how do i go about it? We have asked the good folks at the CVSE for clarification here. Stay tuned! The decision for the insurance weight lies with ICBC, so you will have to ask them directly once more. Licensed weights for commercial vehicles are established by law, via Division 6(10 and 11) of the Commercial Transport Act and here is some background information on that for you: http://www.bclaws.ca/civix/document/id/complete/statreg/96058_01#section6 Hope that this helps! I am wondering if the requirement to has the company name and GVWR on the door of a commercial vehicle still exists, and where I can find that in the regulations. In the National Safety Code…. Division 37 of the MVA Regulations…as follows…key phrase “who holds a safety certificate”…if you have an NSC number you need to comply. (b) in a manner that makes that name clearly visible to the public. No BC requirement for weight posting but some jurisdciation may require it. NSC tells us that placing of NSC number is not encouraged. Name, in contrasting colors 2 inches (5cm) big suffices…each side. The Motor Vehicle Act, which applies to all vehicles operated on provincial roads, picks up that same definition of a commercial vehicle. Different programs and branches of government would treat these vehicles differently depending on the purpose of the program or service, and your specific question about BC Ferries’ policies should likely be addressed to them. For CVSE, some requirements, such as the requirement to stop at scales, are applied using the registered weight of the vehicle (vehicles over 5500kg GVW ). You can find signs to this effect at scales across the province. In most cases, a scale inspector is going to be pretty uninterested in close examination of a U-Haul type vehicle. Typically, trucks loaded with personal household items would we well within legal weights as set out in Appendix B of the Commercial Transport Regulations. Still, depending what you loaded into it, there is potential to significantly overload a vehicle with a large carrying box on the back, and a vehicle loaded that way could be unsafe. In that case, it would be in the interest of the driver, and the other traffic on the road, for the enforcement staff to let the driver know he is running heavy. So, I have a one ton Dually with a heavy double axle flat deck that used to haul small excavators and Bob Cats. I have a 2/4 ton pick up loaded on it. Do I need to cross the scales? Weights are all within limits. I think the truck needs to be insured to legally transport on a car trailer. Unless you are a towing compNy. Do I need to report to the scales? Good question Rob – we have sent your question to the CVSE – stay tuned for an answer. I am looking to purchase a 5 tonne truck with air brakes. pre-trip inspections required after what GVW? Daily log report required after what GVW? Here is the response our staff in the CVSE. Hope it helps and if you need any further information, please let us know. Q. I am looking to purchase a 5 tonne truck with air brakes. What are some things I should take into consideration before purchasing(in regards to the scale requirements or CVSE) pre-trip inspections required after what GVW? Daily log report required after what GVW? For a truck or truck tractor with a licensed gross vehicle weight exceeding 5 000 kg. A 5 Ton truck would require a National Safety Code Certificate (NSC), which means a certificate issued under section 37.04 of the Motor Vehicle Act Regulations. a. A 2 axle vehicle with a licensed gross vehicle weight exceeding 14 600 kg requires a written trip inspection record. b. A 2 axle vehicle with a licensed gross vehicle weight not exceeding 14 600 kg is exempt from having to produce a written trip inspection record; however a trip inspection of the vehicle must be done daily; a written record is not required in this case. Motor Vehicle Act Regulations Div. 37.18.01 (1) reads; A carrier must require every driver to fill out and every driver must fill out a daily log each day that accounts for all of the driver’s on-duty time and off-duty time for that day. (c) the carrier maintains accurate and legible records showing, for each day, the driver’s duty status and elected cycle, the hour at which each duty status begins and ends and the total number of hours spent in each status and keeps those records for a minimum period of 6 months after the day on which they were recorded. Put 1001kg of bricks in the back. Then your gvw goes up. I have recently moved from Toronto, Ontario to Duncan, BC. My household possessions are being shipped by a professional removals company. They will arrive in Vancouver very soon where they will offload the truck/trailer and put onto another truck/trailer for onward delivery to my address on the island. Now, my question is whether am I able to utilize the scale weighing facilities just outside of Duncan to weigh the truck before and after my possession are removed? I would like to be present on both occasions to inspect the results. The reason for this is because I am disputing the weight amount of my possessions claimed by the company…not just by a bit but double!! Thank you for any help/advice you can provide. We have sent your question forward to the Commercial Vehicle Safety and Enforcement Office and will get you an answer as soon as we have one! That’s great, thank you for finding that out. I have a fifth wheel trailer with a dry weight 11,200lbs and a Dodge Powerwagon 3/4ton 5.7L Hemi with 4.56 gears in it, if I put air bags on the truck for leveling the trailer would the Department of Transportation in BC also recognize the added ability for more weight on the truck? Please contact me ASAP if you require more information to help me out with this. Thank you for your time. Let me pass your question along to the good folks in the Commercial Vehicle Safety Enforcement Branch. They should have the answer for you. Great question and one that comes up frequently. Both the Motor Vehicle Act Regulations and the Commercial Transport Act Regulations prohibit any vehicle from exceeding the Manufacturer axle ratings and/or the Manufacturer Gross Vehicle Weight Ratings(GVWR for short). These maximum manufacturer numbers can be found typically on a compliance sticker located on the driver’s side door post of the vehicle. The manufacturers have tested all aspects of the vehicle from suspension, steering, braking components, axle components (the list goes on) to determine the maximum weights the entire vehicle can safely handle under most driving conditions. By changing one component, there is no way to be sure that those same safety standards can be complied with. The legislation reads in a way that you cannot exceed the manufacturers ratings. In order to carry more weight after altering a vehicle you would need to have the manufacturer reassess your vehicle to determine if they will affix a new vehicle rating. To sum it up, regardless of what might be perceived as allowing extra weight by the addition of not originally manufactured parts, the vehicle will still be limited by the original manufacturer’s weight ratings affixed to the vehicle. i have conflicting information about the weight of my travel trailer. do you weigh non commercial vehicles? Good question. Let us connect you with the folks in the CVSE for more information. what was the answer to Brians question ? Not typically although we have the ability to if a legitimate reason exists. Each case would be considered on its own merits. We weigh vehicles post collision for police collision reconstructionists so they can use momentum equations for speed determination. Or private vehicle owners with trailers or loads if they have a concern. I will be driving a 14′ U Haul van containing my household goods from California to my new home in Alaska. Along with the van, I will also tow my car on a 20′ trailer. Please tell me if I am required to stop at weigh stations and what are their exact locations so that I can enter them into my GPS unit. We have spoken with the Commercial Vehicle Safety Enforcement and they informed us that you will be required to report to the weigh scales. If the truck you rent does not have BC on the apportioned cab, you will need to obtain a permit prior to entering BC. They suggested that you check with the rental company to see if they have trucks pro rated for BC.